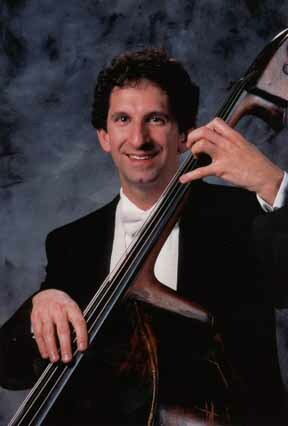 Nico Abondolo is internationally recognized as a leading double bass soloist and chamber musician. He made his debut at the age of 14 with the Los Angeles Philharmonic and in 1983 became the first double bassist ever to win first place in the International Competition for Musical Performers in Geneva, Switzerland. Since then he has appeared with orchestras and in recital throughout the U.S. and Europe. Mr. Abondolo is professor of Bass at USC Thornton School of Music and the Music Academy of the West. For seven seasons he was principal bass of San Francisco's New Century Chamber Orchestra with whom he recorded Ginastera's Concerto per Corde. He has been co-director and composer for the Perks Dance Music Theatre. He is the principal bass for many film composers including John Williams, Hans Zimmer and Thomas Newman. Mr. Abondolo regularly performs chamber music with the La Jolla Summerfest, Musik III Festival, and the Music Academy of the West. He studied at USC with Peter Mercurio and Dennis Trembly, at the Academia Chigiana with Franco Petracchi and with David Walter at the Juilliard School. Two for David is dedicated to my teacher, mentor and friend, David Walter. These pieces are a small thank you for your inspiration, wisdom and encouragement. I enjoy exploring the quiet colors and textures of the double bass. Two for David is inspired by the Chinese Gu-chin, an instrument shown to me by Christopher Roberts, composer/bassist and David Walter student. The Gu-chin resembles the fret-board of a fretless bass guitar. Ten or so silk strings are plucked with fingers creating a soft yet resonant tone. I also enjoy creating performance latitude for the player. In piece No. 2, the opening and closing statements can have the spontaneous quality of the Ad Lib section.